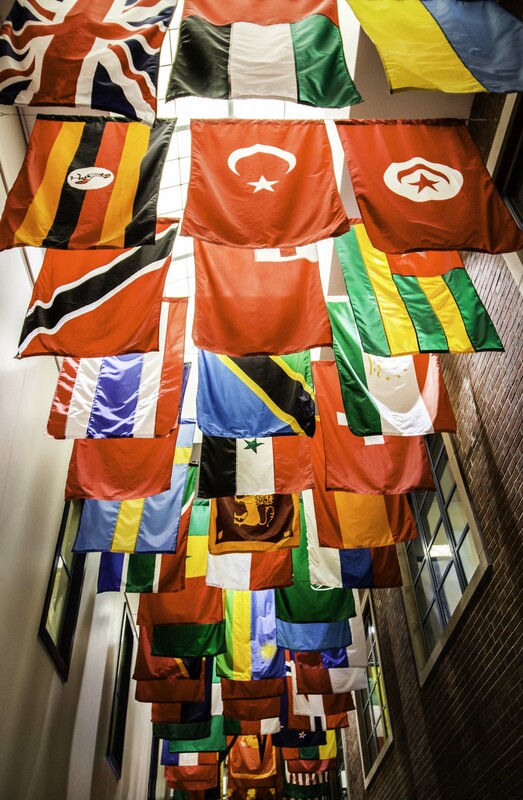 Grace DeSanti | Flags hang in the Atrium of the Memorial Union that represents every nation which students are from. Over the past year, the University of Rhode Island has increased its international representation on campus from 68 countries to 76 countries through global outreach strategies and an academic strategic plan. Dr. Gifty Ako-Adounvo, the inaugural Vice Provost for Global Initiatives at URI, was brought to the Kingston campus to develop URI’s international advancements after an international search for the position. 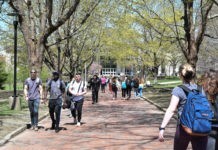 She cited the academic plan as her reasoning for committing to URI after a long tenure at Ohio State University. The University’s goal to “Grow a global presence” in the academic strategic plan is outlined by six additional strategies and numerous actions to facilitate this initiative. 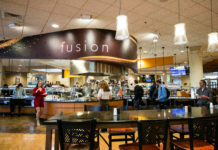 One of these strategies is to “Articulate and prioritize internationalization of institution-wide strategic plans and faculty hires.” In doing this, URI will strive to ensure global outreach is valued, foster a campus community that reflects that of the global community, provide professional development for faculty to increase their globalization, and more. The University is steering towards internationalization in all departments, and their global strategy spans the University. It is emphasized by President David M. Dooley’s initiatives, in the development of the new General Education program and from the Global Steering Committee, chaired by Ako-Adounvo. The Global Steering Committee is comprised of faculty and staff all across campus to help make communication regarding internationalization more effective throughout all colleges and programs. Additionally, URI faculty has completed research across the world and established powerful connections to two specific countries: Indonesia and the Philippines. The plan has paved the way for URI to develop as an internationally represented University, through both outreach programs and opportunities abroad. As URI continues to make an effort to bring international perspectives to Kingston, the Office of the Provost encourages all students to attend events that represent other cultures and traditions. URI’s next international event is the Chinese Spring Festival on Feb. 16 at 6 p.m. in the Memorial Union.